In the way that Apple changed the music industry through its revolutionary digital streaming business model, autonomous driving will disrupt and reshape the future of the auto industry in the next 10 to 15 years. “It is no longer a question of whether it will happen, but when”, according to Roman Fernandez, a senior consultant at Roland Berger, whose firm is widely considered a thought leader in this space. Roland Berger has developed an Automotive Disruption Radar to help automotive companies prepare for the coming disruption. The radar systematically tracks 25 early indicators of disruption happening in each of the most important markets of the world. Their insights provide great value for the big automotive firms but what does this mean for the consumer? 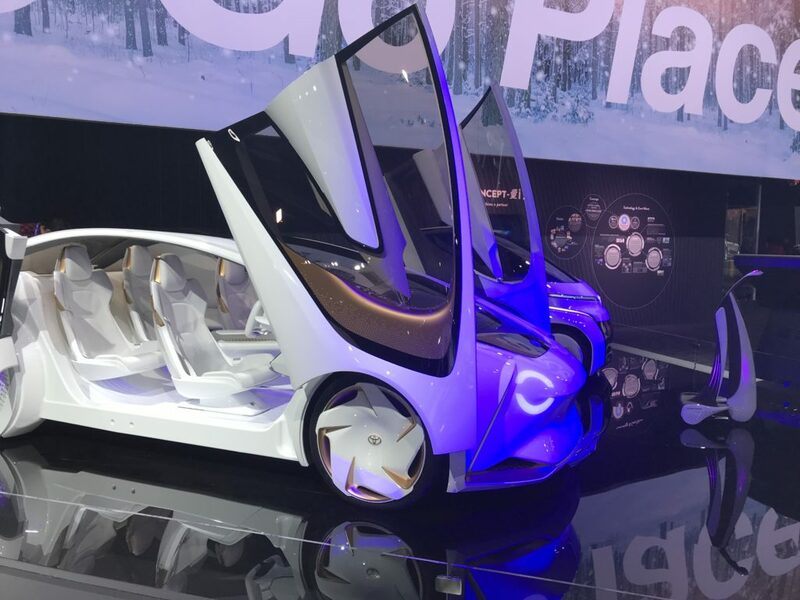 According to recent developments and conversation with other experts, it appears that the intelligent cars of tomorrow won’t be just machines — they will be something you have an emotional connection with, like you would with a friend or family member. Just like Toyota. While most are eagerly anticipating the North American International Auto Show (NAIAS) 2018, I had a first glimpse on Media Day. Many automakers and new models caught my attention, but Toyota’s Concept-i series inspired me to go back a second time. The display strongly reflected Blended Collective’s strong belief that consumers connect with brands the same way they connect with people. Toyota’s vision of creating “partners in mobility”, as explained by Maggie, one of their product specialists at NAIAS, describes an emotional link between the driver and the car through artificial intelligence and mobility. This car series evokes an emotional feeling that makes driving fun, safe and engaging. The car series’ name is a play on the Japanese word for love “ai”, which, in English, is pronounced like the letter “I”. The term “Aisha” in Japanese translates to “a car that is cherished and loved by people”. Things that move our heart, such as meeting new people and having new experiences, are all opportunities that cars can provide through mobility. This cultural play on words mirrors Toyota’s belief and desire to instill its future intelligent cars with an emotional connection to the driver, rather than treating them purely as a machine. Toyota’s vision is further supported by its tagline, “More than a machine, a partner. Learn. Grow. Love.” along with technology and core values to protect, learn, and inspire. “Protect” refers to learning about people and automated driving in a way where the outside situation, as well as the driver’s condition and reliability are continuously monitored. This is done by switching from manual to autonomous driving when needed for safety. “Learn”, the second core value, explains that innovation occurs from learning about people. Learning about the driver’s emotions, alertness, and facial expressions, allows for a more comfortable driving experience. The last core value, “Inspire”, involves an agent, the female Asian voice named Yui, who learns about the driver’s tastes and individual preferences. For instance, the car understands that driving on congested roads where the driver is exposed to accidents can cause a feeling of irritation. Therefore, the car would suggest to pass an alternate route to create a feeling of happiness. Connecting emotions to location information and subsequently using them as Big Data, is referred to as Toyota’s “Emotion Map”. So, how else does Toyota evoke human emotion with its Concept-i model? To emphasize the in-depth connection between the car and driver, the car is described as having a “new soul”. The more time the car spends with the driver, the more attached it will be, just like a friend or family member. But does attachment suffice? What about trust? Yui gets to know you through conversation and by reading your emotions. She ensures you are safe while enjoying the ride and is there for you whenever you need her, customized to your individual taste and preferences. Oh, and Amazon’s Alexa has also found its way to be integrated in this new concept. Looking at previous marketing campaigns and advertising, emotional branding is not new at Toyota. The brand’s car and visual display at NAIAS was a phenomenal alignment with this marketing strategy by utilizing wording such as “beloved”, “soul of a car”, and “emotion map”. Toyota’s strategy continues to be a paradigm in today’s world of marketing to connect consumers with brands and drive consumer purchase intent and sales. According to several studies, consumers in the major markets are starting to accept electrical vehicles and self-driving cars, but regulation for this disruption is still not in place. Would you buy a car that’s fully autonomous? Why? Why not?